Australian mainsheet trimmer Luke Molloy will race with the Russians, Team Synergy, at Audi MedCup in Marseille this week. Molloy started the MedCup series in Cascais last month as a crew member with four time Olympic medallist Jochen Schuemann with the German/French Team, Audi Sailing Team Powered By ALL4One, the only newly launched boat to be built at McConaghy Yachts in Sydney. “We've had no chance to train before coming here, because we had to get some work done on the boat, so it went to Burriana (Spain) where it was built. There were many things that had to be changed, the boat was quite unfinished in Cascais. 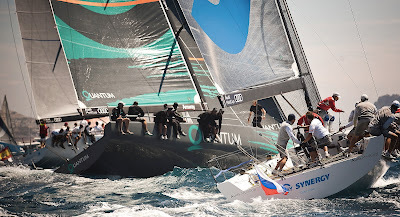 We've changed our main sail trimmer, Chris Main, and now Luke Molloy in his place,” said Synergy's tactician, Kiwi Rod Dawson.